Is the hotel near the sea? The hotel is just 30 metres from the sea; after leaving the hotel, a few steps and you’ll be on the beach. We have agreed special rates for guests with Bagno Lido no. 72, just in front of the hotel. Rooms are available by 12:00 pm on arrival day and must be vacated by 10:00 am on departure day. Does the hotel have a private car park? Parking is free for all guests. There are two options, depending on availability: an unattended car park directly at the hotel or a private, covered and enclosed car park with video surveillance about 300 metres away. If all free places have been used, car parking facilities are available at special rates in an attended and enclosed car park about 300 metres from the hotel. Wi-fi connection is available in both the foyer and rooms and is free for all our guests. An internet point in the foyer is always available. The Municipality of Bellaria Igea Marina has its guests at heart and has refused to apply a tourist tax. Therefore, there will be no supplement to pay for the nights spent at our hotel. What are the advantages if I book in advance? There are always great offers for those who book in advance! First of all, you can choose the best accommodation with sea view at great prices. With the “Book Immediately” offer there are direct discounts for all holiday periods! We warmly welcome pets such as dogs, cats, hamsters, birds, fish and even plants. Dogs can stay in the public areas, but not in the restaurant. It is important that they do not disturb other guests at night and during resting times. You can also take your pets to the beach! Bagno Lido no. 72 has enclosed areas reserved for families with dogs, however, by law they are not allowed into the water. At Gelso Nature Park you can take them on long walks and you’ll also find an enclosed area, with a water fountain, where they can run around. A daily charge of € 5.00 applies to each pet for the extra cleaning required. A vet is located nearby. Is there an entertainer for kids? Does the hotel have a babysitter? The hotel does not have an entertainer. On the beach in front of the hotel there is a games area and a mini-club with activities for kids of all ages, with fun snacks served too! A babysitter service is available on request at great prices with qualified and reliable staff. Does the hotel have bicycles? Brand new bicycles are available for guests free of charge. There’s also child seats for our youngest guests. You can also ride around Bellaria Igea Marina on the cute City Train. What type of cuisine does the hotel serve? The hotel serves predominately vegan cuisine, but traditional local cuisine is also served. This can be seen in our lavish buffets which are always designed for both meat-eaters ang vegans: you’ll find a buffet of appetizers with cereals, pulses, grilled vegetables, pulse hummus or creamed vegetables, pickles and salads. There’s also a fresh vegetable buffet for salads and a buffet or fruit and vegan cakes/desserts. And our hot buffets have hot starters, main courses and side dishes that are divided into two sections – vegan and traditional. The times of our buffets are not fixed and the same for everyone. They are flexible to allow all our guests to have lunch and dinner based on their habits or to stay on the beach a little longer! Breakfast: from 7:45 am to 9:30 am – Lunch: from 12:30 pm to 1:15 pm – Dinner: from 7:30 pm to 8:15 pm. For our youngest guests, the restaurant is also open at earlier times. Is the hotel near the centre of town? The hotel is in a quiet, central position close to the square on which Igea Marina church stands and which all the shopping streets lead off from. Nearby, you’ll find a newsagent, tobacconist, minimarket, herbalist, hairdresser, pharmacy, bakery, florist, bazaar, jeweller and medical clinic. Is it easy to reach the hotel by train? 1 – the Rimini-Ravenna train stops at Igea Marina. It takes about 20 minutes. The hotel is about 500 metres from the station. 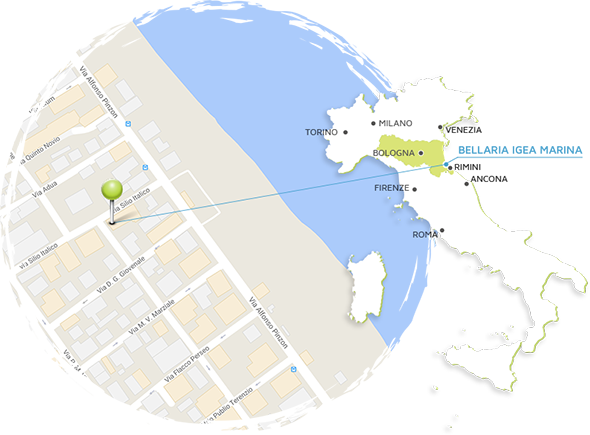 Take Via Virgilio and head towards the church, then turn right onto Via S. Italico, which is where the hotel is located. 2 – the Rimini-San Mauro Mare no. 4 bus stops at every stop on the sea front. Our stop in Igea Marina is no. 41, which is just in front of the hotel. Simply cross the road and you are here. The bus station is just in front of Rimini train station. The bus leaves every 30 minutes and takes about 45 minutes. The hotel has a panoramic lift to the first and second floors. It does not go up to the attic. To reach it, guests will have to take the lift to the second floor then climb two flights of stairs. Guests can pay in cash, up to € 3,000.00 or by debit card, cheque, credit card (Visa, Mastercard) or bank transfer. On the hotel website’s offers page, you’ll find all our updated special offers with promotional weeks, free drinks cards or free beach for new guests, as well as super offers for 14-night holidays and for those travelling with their family! Do I pay extra for a sea view? A sea view is always free at our hotel until all the rooms with one have gone. There are rooms with a balcony and side sea view and rooms with French windows and front sea view. Are there special facilities for kids at the hotel? For kids we have an indoor games area with building blocks, books, colouring pens, games, video tapes and DVDs, paper and puzzles and an outdoor space with a slide, a swing and a Wendy house. There are also lots of facilities for our youngest guests: new beds with safety barriers, safety barriers, highchairs, feeding kits, small bath tubs, potties/toilet seats and bicycles with kids’ seats. There’s also a small kitchenette with a fridge, microwave oven and electric hotplates for mums to use in the restaurant. For our youngest guests, on request we can offer in the kitchenette, salt-free vegetable broth, creamed vegetable soups, creamed pulse soup, pasta for broth and cereals. You’ll find everything in the kitchenette fridge and will be free to mix it all based on the eating habits of your kids and at the times you most prefer. Are there any parks for kids? A short distance from the hotel there’s a lovely natural park called Gelso Park (covering 2,500 hectares) where you can take lovely walks surrounded by lush greenery and where you’ll find wooden games and a small lake with local fauna. About 500 metres from the hotel there are two games parks (Paperopoli and Santafè) and a funfair for kids of all ages. Do you have special reduced ticket prices for the amusement parks on the Riviera? The hotel has special agreements with all parks on the Riviera including: Mirabilandia, Italia in Miniatura, Oltremare, Aquafan, Cattolica Aquarium and Skypark, with discounted tickets available. What will I find in my vegan breakfast? For breakfast, you can ask for cappuccinos made using plant milks. There’s a special island with rice and soy milk, natural and fruit soy yoghurt, sugar-free jams, agave syrup or barley malt syrup, rice and corn cakes, whole cereals, seeds and dried fruit and nuts and homemade rye bread. In the morning, guests can use an extractor to make fresh fruit and vegetable juices. All cakes at breakfast (tarts, plum cakes, doughnuts, chocolate cakes and croissants) are vegan and homemade. Do you have special menus for celiacs? No problem, the hotel also offers gluten-free menus. Many dishes in the vegan section are already suitable for celiacs too. Naturally, depending on the menu of the day, for those who require it, the same dishes will be served gluten-free: gluten-free pasta, gluten-free cereals, pulses, vegetables, etc. As well as gluten-free bread and desserts.